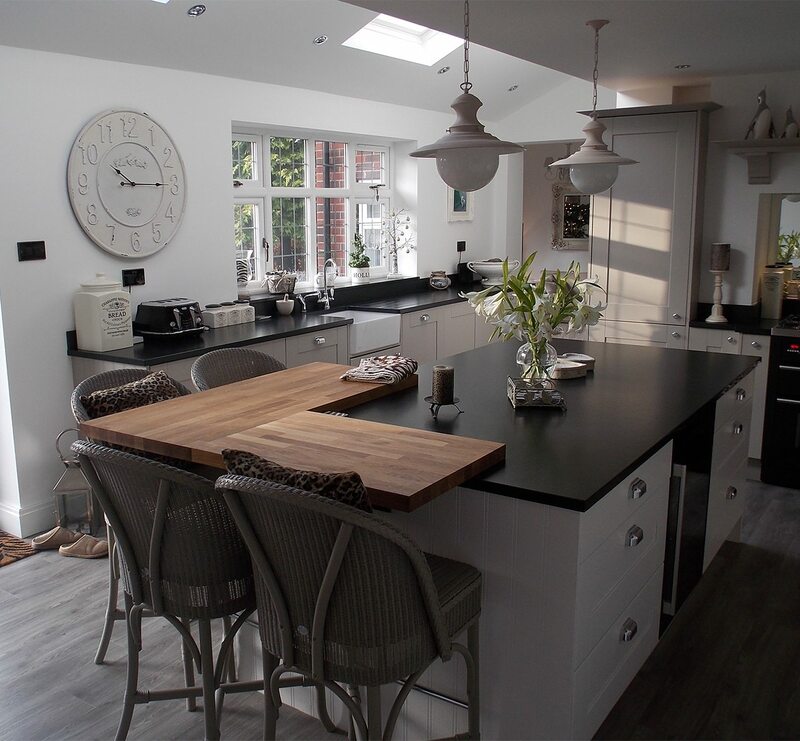 Jo and Alan Lewis were ecstatic when Kitchen Design Centre transformed their tiny kitchen into a spacious, bright, modern living area. 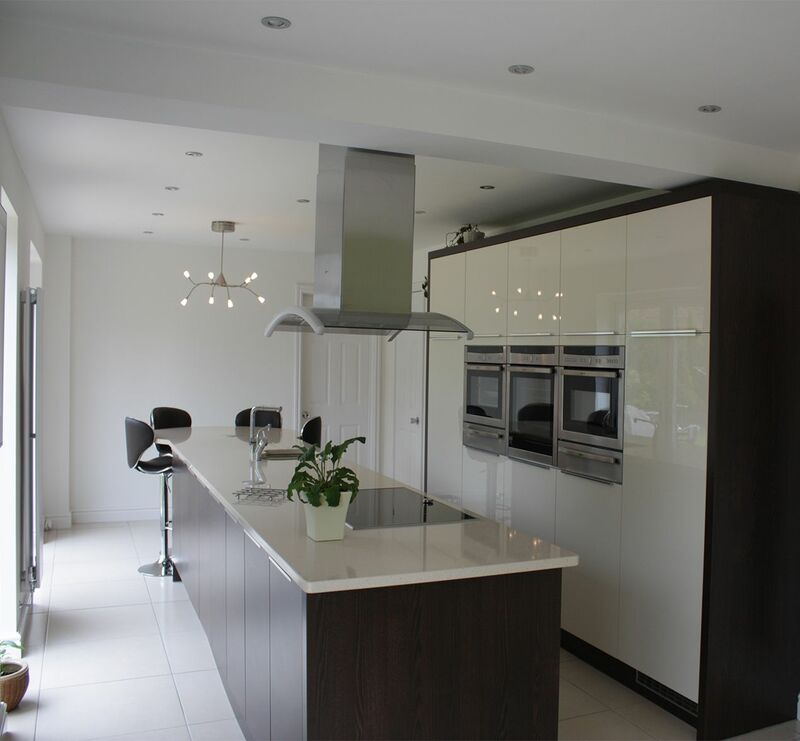 Their detached house, in the rural area of Diggle, near Saddleworth, was in desperate need of kitchen renovation work. The old room, a traditional terracotta and oak kitchen, overlooked a beautiful landscape, but its shape, and lack of windows meant that its owners did not enjoy the wonderful countryside views available. 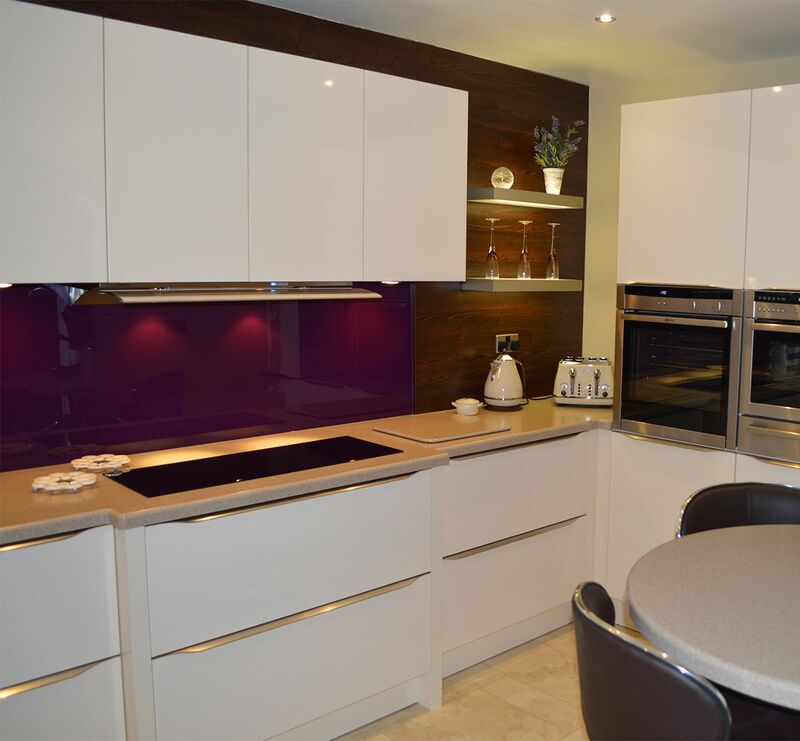 After visiting various kitchen showrooms in the Manchester area, the couple decided that Kitchen Design Centre was the ideal company to transform their kitchen. Although they had a basic idea of what they wanted, designer Suzanne made various suggestions of her own to help them improve the look of the room and make the whole space work properly. Suzanne said: “I instantly knew how to improve the room. The old wooden oak kitchen felt cramped and dark. 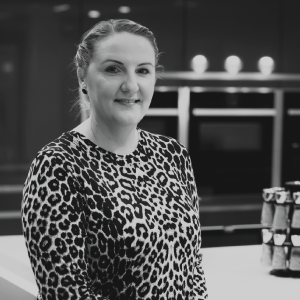 Soon after Suzanne’s suggestions and design ideas, Kitchen Design Centre started the work and transformed the entire look of the kitchen. 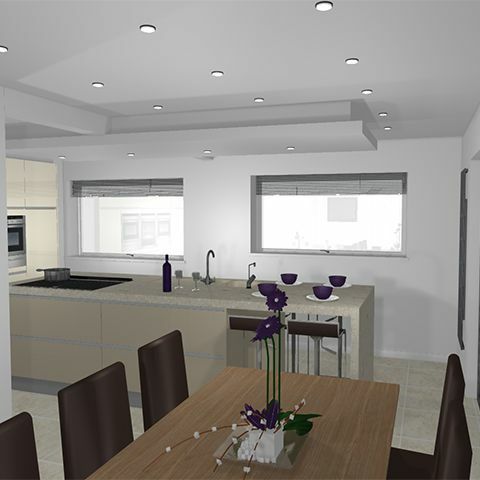 Now, with amazing views of the rural area surrounding the house, the kitchen is large, bright, spacious, easy-to-use and includes a dining area complete with wall TV and bi-folding doors. In the centre of the kitchen, there is long central island, which acts as the kitchen’s workspace. Surrounding this central workspace are integrated Neff appliances to save space and give ease of use. The central island includes an innovative “downdraft extractor”. Downdraft extractors are recent inventions. Rising gracefully out of the island unit when you want to use it, the down draft extractor is hidden away into the kitchen work surface when it is not in use. There is also a “Quooker” boiling hot water tap – connected to a small tank underneath the sink, which is, in turn, connected to the water supply, and is electrically heated in a very economical way. 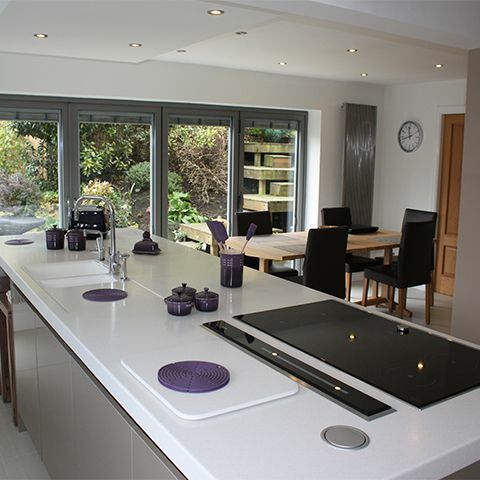 Jo said: “There are so many features which make this kitchen a joy to work in. It’s so very useful to have deep drawers – with everything easy to find and in easy reach. The ‘German handle-less kitchen’ includes seamless Corian worktops with a lovely smooth finish, which are practical in many different ways. 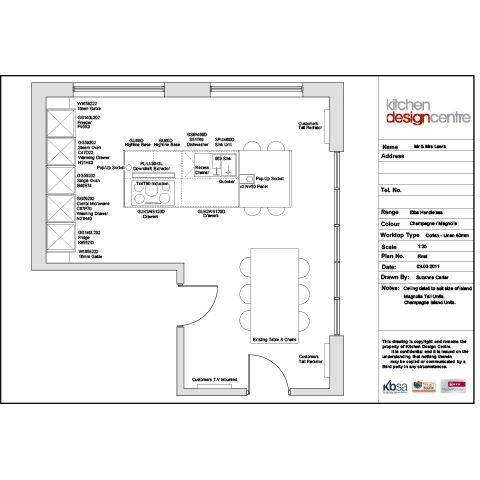 The room now includes bi-folding external doors – with all the building work coordinated by Kitchen Design Centre. Jo Lewis said: “Designer Suzanne and John, the fitter, did an amazing job – helpful, speedy and very attentive to what I wanted. "We wanted a more contemporary, spacious feel in the room and to ‘display’ the natural views better"
"I instantly knew how to improve the room. The old wooden oak kitchen felt cramped and dark"
"I suggested knocking the wall through that led to a separate dining room and adding two large windows. It really gave the room more life and made it incredibly spacious."